The Mad Bookie app offers competitive odds, enticing promotions, and superior customer service. If we take into account its constant improvement of services, we can see why it’s one of the fastest growing bookmakers in Australia. As you can see from the table, Mad Bookie mobile app is available both for Android and iOS users. The procedure of downloading and installing the Mad Bookies mobile app is not complicated at all. However, there are some minor differences depending on the operating system of your mobile device. If you want to install the Mad Bookie app on iPhone, iPad or iPod touch make sure to follow this step by step guide. The Mad Bookie mobile app requires iOS 8.0 or later, so check if it’s compatible with your device. You must be at least 18 years old in order to download and use this application. If both these conditions are satisfied, visit Apple Store and search for Mad Bookie app. The size of the application is just 30.4 MB. Click the “Download” button. The download process will automatically begin. Once the app is downloaded it will be installed on your device. Create your account if you don’t already have one. Log in and enjoy the ultimate sports betting adventure! Open the Mad Bookie’s website on a browser of your device. On the right side of the screen click on “Download our Android app!”. Once the app is downloaded go to Downloads via the notification bar or open the Downloads folder on your phone. Tap MadBookie.apk to initiate the installation procedure. Once the Mad Bookie mobile app is installed create a new account or log in if you already have it. Like we have already mentioned there are certain system requirements. Apple devices must have iOS 8 or later. 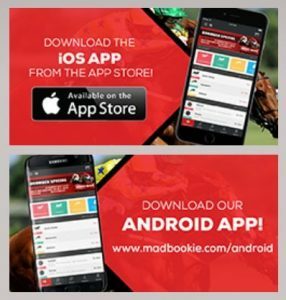 When it comes to Android devices, once you download the Mad Bookie app it is possible that the installation procedure doesn’t start right away. Check the box Unknown Sources. Find the downloaded file and click on it. Once the installation procedure is over you are ready to start placing your bets and enjoy the Mad Bookie mobile app. Mad Bookie doesn’t have any welcome bonus available. But after registration, you’ll be able to collect Madbookie free bets and benefit from various promotions. see if you have any coupon available and on which bets you can use it. Before you decide to use any freebet make sure to read all the terms and conditions. The Mad Bookie is divided into two different sections: Sport and Racing. Once you choose the Sports section you’ll have a lot of different sports events listed in front of you. These are the upcoming matches. You can also see when it will start and how many minutes you have to place your bets. When it comes to sports betting options there are a lot of different sports and events to chose from. At Mad Bookie you can find the following sports: baseball, basketball, boxing, cricket, cycling, tennis, golf, soccer, rugby, volleyball, MMA, NFL, NHL, Yacht Racing, and so on. The Racing section also includes various betting options. First, you can choose between horse races and greyhounds races. You can also choose to see only today’s racing or the races in the next few days. The choice is yours. This makes the Mad Bookie mobile app an even better choice, as you get plenty of different options available. In order to facilitate you the use of Mad Bookie app, let’s see what are some of the most frequently asked questions. In order to make a deposit, click on “My Account” and choose the deposit option. Pick a payment method and complete the required information. When you finish, just click the button. Click on “My Account” and select the withdraw option. Fill in all the required fields and enter the amount you want to withdraw. Once it’s over, submit your request. Customer service is always an important aspect to consider. Mad Bookie offers quite a lot of methods including phone, email and live chat option. What’s more, the team support is fast, friendly and efficient. In conclusion, let’s take a quick look at all the good sides and bad sides of the Mad Bookie mobile app. Speedy and professional customer service, highly intuitive and easy to use application, enticing promotions, these are the words that describe the Mad Bookie. All in all, the best thing is to check and see for yourself!